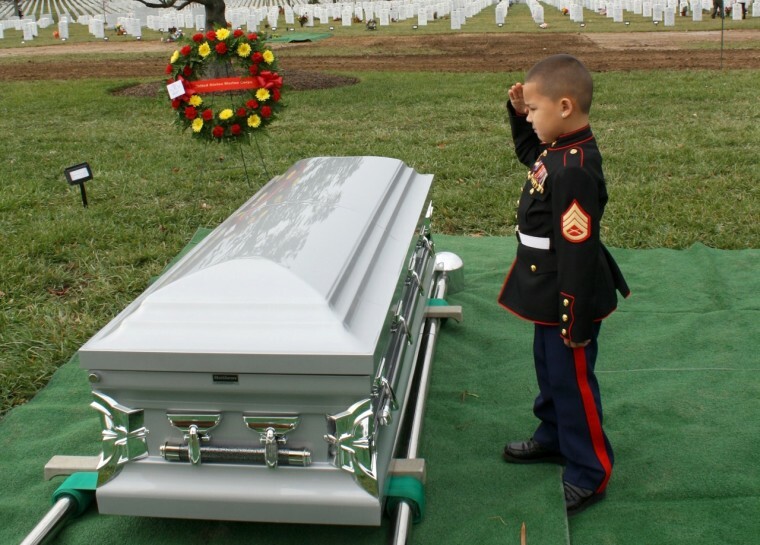 "My son used to say he wanted to die for one day and come back, so he could visit papi in heaven,” said the widow of a Marine Corps Staff Sergeant. Things seemed to be going so well for Veronica Ortiz Rivera one rainy morning in November 2010. She’d awakened before her alarm went off, allowing her to fall back into the most peaceful sleep she’d had in years. Later she was wrapping Christmas presents to mail to her husband, who was serving in Afghanistan, when there was a knock at the door. Glancing out, she saw marines in dress uniforms. Ortiz Rivera’s husband, Marine Staff Sergeant Javier Ortiz Rivera, had been killed by a roadside bomb. That's how she found herself a member of a Gold Star family, a term referring to those who have lost immediate family members in combat or in support of certain military operations. Like all Gold Star families, Latino Gold Star families share a bond of grief, loss, and pride on Memorial Day — and their struggles are both unique and universal. It is difficult to calculate the number of Latino Gold Star families. According to the Pew Research Center, in 2015 Hispanics comprised 12 percent of active-duty military personnel. The Department of Defense tallies casualties by war or conflict, and breaks down the demographics of casualties, yet these statistics do not give the precise number of Latino Gold Star families, which can include spouses of non-Hispanic service members. For Ortiz Rivera, losing her husband was overwhelming. “It was hard explaining the concept of death and heaven to my kids, who were 8, 5, and 3. My son used to say he wanted to die for one day and come back, so he could visit papi in heaven.” She credits her faith with getting her through her darkest moments. Ortiz Rivera cherishes the memory of her last call with her husband. That was the last time she would hear his voice. The next day, she was informed of his death. Frederick P. Aguirre, a retired Superior Court judge in California and president of Latino Advocates for Education, believes it is important to recognize the contributions and sacrifices of Latinos in the U.S. military. “It is not well known that Hispanics have served our country from the Revolutionary War to the present,” he said. “Latinos also served in the Civil War, World Wars I and II, and every conflict since.” Military conflicts before Vietnam, he pointed out, did not keep statistics for Hispanic servicemen. In World War II, for example, the thousands of Mexican-Americans who served were classified as white. During World War II and the Korean War, a segregated unit of Puerto Ricans served in the 65th Infantry Regiment, known as The Borinqueneers. Among them were Army Private First Class Emiliano Andino Perez. He was captured while fighting in Korea and died a prisoner of war in 1951 at age 32. In 2016, Andino accepted a Congressional Gold Medal on her father’s behalf at a ceremony in New York City. The Department of Defense, Department of Veterans Affairs, and groups like Tragedy Assistance Program for Survivors (TAPS) now offer support to Gold Star families. Several states also offer programs for Gold Star families as well. However, Latinos often lag behind other groups in accessing mental health care, and there can be real or perceived barriers that prevent Hispanic families from seeking out resources available to them. Until 2005, American Gold Star Mothers did not allow non-citizens to join. It changed its policy following a backlash after the group denied membership to a Filipino woman in New York whose son was killed in Afghanistan. Some families of mixed immigration status, wary of attracting the government’s attention, may not seek survivor benefits. In 2012, Arredondo’s son Brian committed suicide at 24, which his father believes was largely because he struggled after his brother’s death. Today, Arredondo and his wife Melida run the Arredondo Family Foundation, whose mission is to empower Massachusetts military families in the prevention of military-related suicides and to provide other support services. For Latino Gold Star families, holding on to the memories of their loved ones allows them face the future. Yet while helping others, receiving counseling, and finding a supportive community can aid the grieving process, the pain does not go away.